To feed a growing population and meet the challenge of climate change, agricultural production must intensify in a sustainable way, and innovation is key to make that happen. A sustainable intensification of agriculture is particularly needed in the tropics, where FAO is involved in the Tropical Agriculture Platform (TAP). Initiated by the G20 and generously supported by the European Union, TAP focuses on the development of national capacities for agricultural innovation in the tropics, where most of the developing countries are located and the capacity gap is especially wide. By helping to bridge the capacity gap, TAP aims to pave the way for agricultural innovations that meet the demands of its principal users – small farmers, small and medium-sized agribusinesses and consumers. To achieve this goals, TAP has embraced the so-called Agricultural Innovation Systems (AIS) perspective, acting as a multilateral dynamic facilitation mechanism that enables better coherence and greater impact of Capacity Development (CD) interventions in AIS. TAP was launched at the first G20-led Meeting of Agriculture Chief Scientists (MACS) in September 2012, Mexico, and FAO was requested to lead its development. The G8 leadership also endorsed the development of TAP. TAP has formed a coalition of more than 40 partners, including national agricultural research, education and extension institutions as well as civil society actors, farmers’ organizations and key regional and international fora, networks and agencies. To consolidate the different existing approaches to agricultural innovation, TAP Partners have approved the TAP Action Plan, which included in 2015 the development of a Common Framework on CD for AIS. In January 2016, following a thorough and highly participatory development process, the TAP Partners have approved the Common Framework for its use by TAP partners and others. Concepts and principles of the TAP Common Framework are being tested in eight countries in Africa (Angola, Burkina Faso, Ethiopia, Rwanda), Asia (Bangladesh, Laos) and Central America (Guatemala, Honduras), as part of the CDAIS. 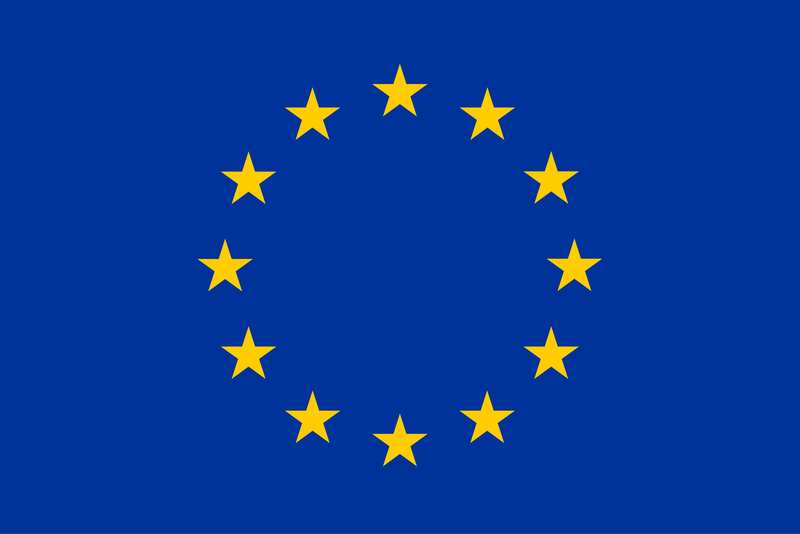 The implementation of the TAP Action Plan and the work in eight countries are made possible thanks to the financial contribution of the European Union to the CDAIS project, to FAO through its staff involvement, to the German government through an Associate Professional Officer and to TAP Partners engaged in the Steering Committee and working groups. 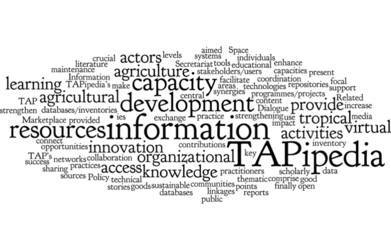 TAPipedia, developed within the context of Tropical Agriculture Platform (TAP), is an information sharing system designed to enhance knowledge exchange in support of Capacity Development (CD) for Agricultural Innovation Systems (AIS). TAPipedia aims to be a global information system for good CD practices, innovation outputs, success stories and lesson learned. TAPipedia allows TAP partners and other stakeholders to share their own applied and context specific CD for AIS resources and to discover such knowledge from different sources, partners and regions. TAPipedia also assist TAP members to present, explain and promote the Common Framework on CD for AIS, so that it may be more easily tested, improved, adopted and implemented by stakeholders. Ultimately, TAPipedia puts focus on facilitation, learning, documentation and knowledge management to enable innovation. And by promoting innovation, TAPipedia will be a key asset to fulfill TAP’s goal of increasing farmers’ income, improving food security and allowing for a sustainable management of natural resources. The website “tapipedia.org” is hosted by the Global Forum on Agricultural Research (GFAR) and managed by the Tropical Agriculture Platform (TAP) Secretariat. Although the TAP Secretariat is hosted by FAO, the website may contain data, information and material created by various information providers. FAO plays no role in, and bears no responsibility for, the content of “tapipedia.org”, and it does not represent or endorse the accuracy or reliability of any of the content of the aforementioned website. Users are responsible for independently verifying the accuracy and completeness of all data, information and contents and bear the sole responsibility and risk for their access and use of the contents of website. Under no circumstances shall FAO, or its affiliates, or any of their respective agents, employees, information providers or content providers be responsible or liable to any user or anyone else for any inaccuracy, error, omission, interruption, deletion, defect, alteration of or use of any content herein, or for its timeliness or completeness, nor shall they be liable for any failure of performance, computer virus or communication line failure, regardless of cause, or for damages of any kind arising out of use, reference to, or reliance on any information contained within the website. While the information contained in this website is periodically updated, no guarantee is given that the information provided in this website is correct, complete, and up-to-date. The designations employed in this website do not imply the expression of any opinion whatsoever on the part of the FAO concerning the legal status of any country, territory, city or area or of its authorities, or concerning the delimitation of its frontiers or boundaries. Hyperlinks to external sites do not represent an endorsement by the FAO of material of such sites, or any associated organisation, product or service. FAO is not responsible for such external internet sites and makes no warranty, either express or implied, as to the accuracy, reliability, or fitness for a particular purpose of their content. Nothing contained in or related to this Disclaimer and Copyright Notice shall be deemed a waiver, express or implied, of the privileges and immunities of FAO., directly or indirectly, for any damage or loss caused or alleged to be caused by or in connection with the use of “tapipedia.org” or reliance on any content made available on or through the website “tapipedia.org”.